I am new to this forum. I acquired this older sewing machine. The cam lid/cover is missing a part that keeps it closed. I am not sure what the part looks like or what it is called so I do not know what to search for. Any suggestions for replacement parts or workarounds to keep the lid closed would be appreciated. I have attached a photo of the cam area so you can see what I am looking for. I'm guessing that you do not have a manual. Maybe you could get one at http://www.sewusa.com/Sewing_Machine...w_Home_672.htm I have been working with a machine that uses cams and one has to move some knobs or levers to insert the cams. It looks to me that the "cam follower" is in the wrong position as indicated with the arrow. Try moving some knobs and seeing if it moves. 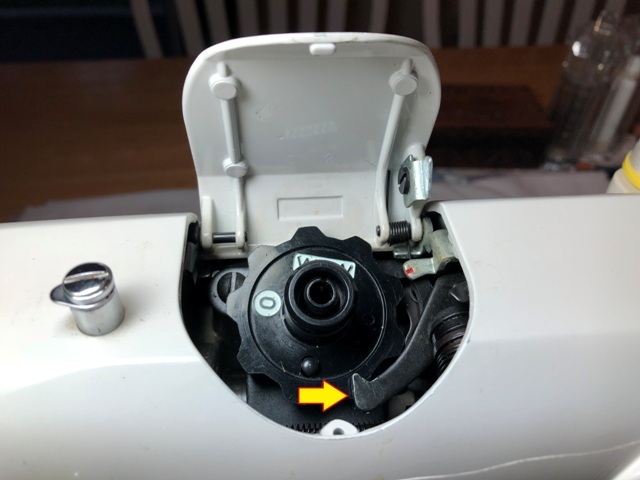 Have you tried removing the cam and does the lid stay closed? You might check https://www.quiltingboard.com/vintag...a-t213584.html It is an older thread and don't know if she still has the machine. Glad that it is sewing well. If you were in the Denver Colorado area, I would like to see if I could figure it out for you. Lacking that, I am going to guess, that it probably has something to do with the metal (silver colored) pieces on the right side of the cam lid and opening. 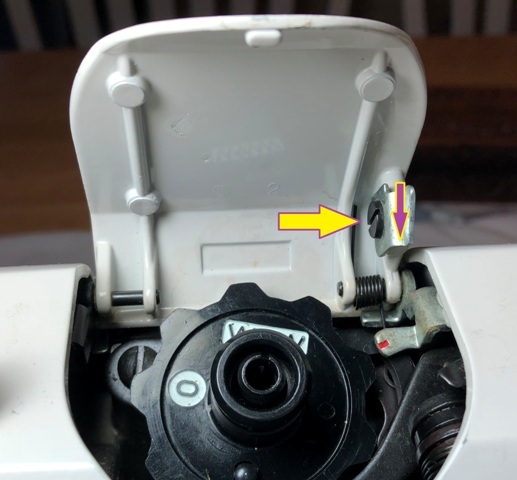 For a work around, I would suggest loosening the screw at the yellow arrow, and see if you can rotate the piece - purple arrow - it is screwing into downward and toward the back of the machine. Be careful, as one can never tell how long that screw is and what other parts are involved. I watched https://www.youtube.com/watch?v=2MTzrVmG-n8 and saw how to open and close the cam door, but I couldn't see the probable parts that were involved. You said "Last night after reading your email I took the cover off the top and started turning the dials. Everything seemed to move like it should including the part you referenced. I found in the manual where it talks about turning the dials a certain way and the cam lid opens." If you can move the piece that I indicated in the above picture, with the top on, and lid open, try moving the dials in the manual that open the lid slowly and see if anything moves. Something just thought of - I'm thinking that if the piece moves as indicated above, you may not be able to close the lid if the other parts that allows it to open is in the way. I think that the silver piece with the red mark on it may release the lid. I know padlocks can be closed even if not on the opening numbers, but unsure if that would be true of this machine. Maybe you have to take the cam out to have the lid close. That's just a thought I had while reading this, but is something I would try. I don't think I've seen a machine that does it that way. You put the cam in, close the lid and sew. Watch the video - it is real short, but shows how to open and also how to "lock" the lid. Actually, I haven't seen a machine with a "locking" cam lid in real person. I know that to change cams, there are specific ways to do it on some machines. Last edited by OurWorkbench; 06-15-2018 at 06:10 PM. I know that to change cams, there are specific ways to do it on some machines. Yeah, even my 401 has certain settings to change the cams. I have to get the book out every time I change a cam, which is seldom, as almost all stitches are built in. I have attached a photo of the cam area so you can see what I am looking for. Are you sure that this cam belongs to this machine? Your cam has a white zero on it and a zig-zag symbol. Opposite the zig-zag symbol, there should be a hole in the cam. If you were able to lift the cam out of the machine, you should see a pin underneath that the hole is seated on. If you look at the YouTube video that OurWorkBench posted, you will see what I'm referring to. In that video, his white zig-zag mark is at the bottom and not at the top like yours. Could the problem be as simple as the cam is seated incorrectly? Your machine was supposedly built between 1967-1972. Other people say it sews like a dream. I watched the video again and think that I steered you wrong. I agree the cam and cam follower seem to be in the wrong position for locking and unlocking the lid. It appears that the pieces that I pointed to seem to be in the correct position for when the lid is open. I can't find a free online manual. If I had the machine in front of me, my inclination would be to raise the needle to the highest position. Then I would follow the instructions in the manual and is indicated in video to hopefully move all the parts to be in a position to open the lid. Next I would probably take the lid off and see where the metal piece that has the red line on it leads to. Maybe jiggle the knob a little and see what moves, if anything. It is possible that there may be some old oil that has glued some pieces together. I would also be interested in what the top looks like from the inside when it is removed and what pieces go from the opening knob to the top of the machine. Sabrena55, I have been wondering if you have found the solution to your machine issue? I have a very similar to this machine with the cam door. Rotating the large knob to the right of the door clockwise dis engages the door latch. I’d suggest rotating that knob slightly left to see if it trips the latch. Otherwise, remove the top cover and look to see if the springs and latches are all connected. Last edited by kmoulton; 06-18-2018 at 01:05 PM.